Founded in 1969 by Yehudi Menuhin, every year Windsor Festival invite the world’s finest musicians, writers, artists, and local performers to entertain audiences, and inspire the next generation of artistic talent and creativity in the Royal town. The organisation runs four separate festivals – Autumn Festival every September, local showcase Spring Leap, which alternates with the International String Competition (for emerging young musicians), and a Schools’ Programme covering music composition, creative writing and visual arts. 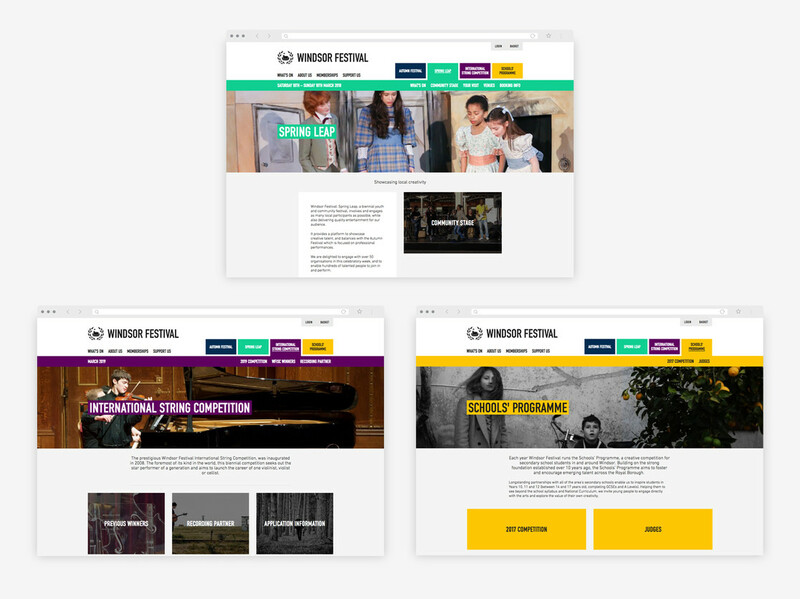 Helping audiences quickly find out what’s on when within such a busy and varied programme, the homepage can be easily altered to focus on any one festival throughout the year. The website is super-easy to navigate; with an instantly understandable main menu ‘tab’ system linking to specific festival landing pages. This also helps to highlight the breadth of what Windsor Festival has to offer. Rather than integrating with the website, event listings and ticketing are both accessed by users on a totally separate system, Monad. This could mean danger of a jumpy, disorientating user experience – however, cunning design and carefully implemented styling across the website and Monad system keep the journey between the two invisible to the user. Smooth online experience? Check. 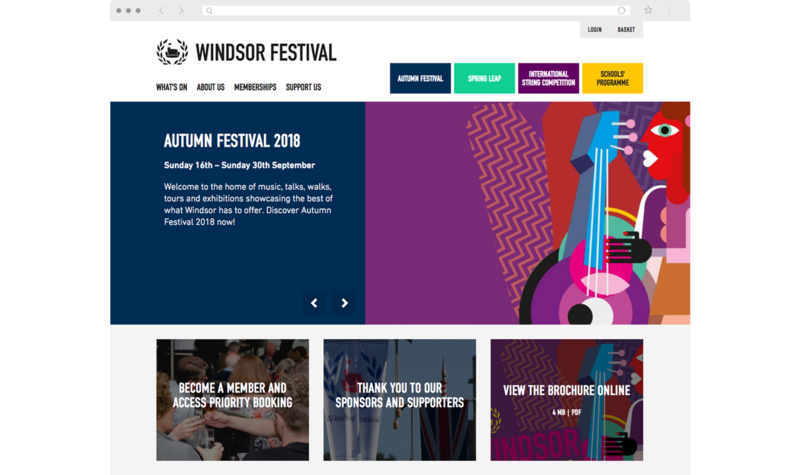 Ticketing provides less than 20% of Windsor Festival’s income, so the various support initiatives on offer needed to be clear and engaging on the website. The Membership and Support sections have been 'built-out' to ensure they're prominent – and sponsors can be clearly highlighted. 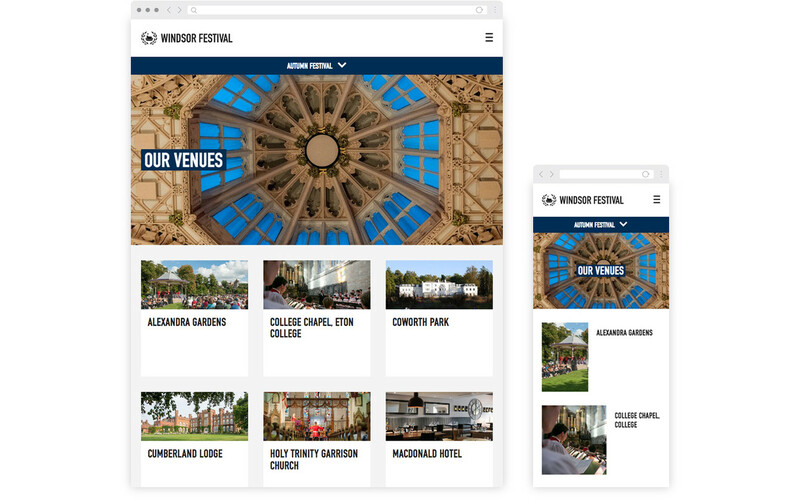 And of course, under the hood, the content management system is designed to be flexible and easy to use for Windsor Festival's small and busy team.